Please allow time for ALL photos to load, she is FABULOUS! Never been displayed and only removed from this box for her photo session. Of course she comes with her certificate and hang tag. 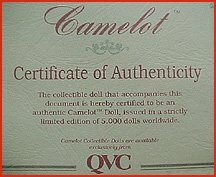 CAMELOT Doll "Faith", a Limited Edition of 5000. 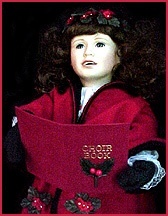 A beautiful Christmas Caroler doll suitable for display and decorative purposes for a business or home, destined to become a true heirloom collectible to be passed on for generations. 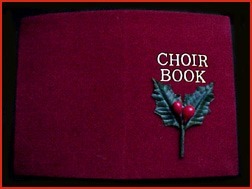 She has a red flocked choral book decorated with a sprig of floral Holly, and as you can see it's the music and words to "Joy to the World". 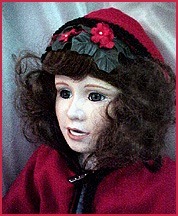 Magnificently crafted, she has porcelain head, hands and feet, wears a red wool, hooded and lined cape decorated with floral Holly, green mittens, long green, multi tiered velvet skirt with a white cotton, lace trim blouse embroidered with the Holly design as well. 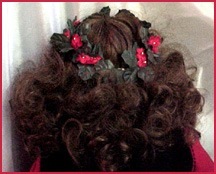 A fabulous Holly wreath accents in her lush full, dark brown long curly hair and she has beautiful green eyes. You have never seen one nicer! Most have thin, straight or wavy hair and are not nearly as well preserved! 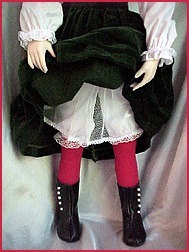 Black high button shoes and red tights, pantaloons and slip complete the outfit. 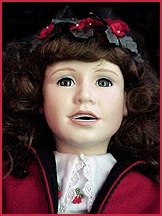 Extremely versatile, she can be posed with her choral book and coat, wear her hood up or down, and of course her coat is removable and she can be displayed almost as a totally different doll! don't miss out on this rare one, retired a few years ago and no longer available! 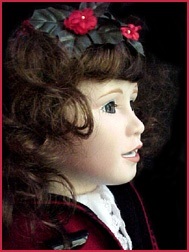 A wonderful keepsake gift for a daughter or grandaughter that will be a treasure for years to come. (and of course ...something for the collector to buy just for the holidays for themselves!) It doesn't get any better than this in terms of collector quality. Look at the photos! What do you think! She will be shipped UPS Insured from 02186 (MA) USA. Buyer to pay shipping, she is approximately seven pounds packed. Outside USA e-mail zip code and country for methods of shipping and quotes.